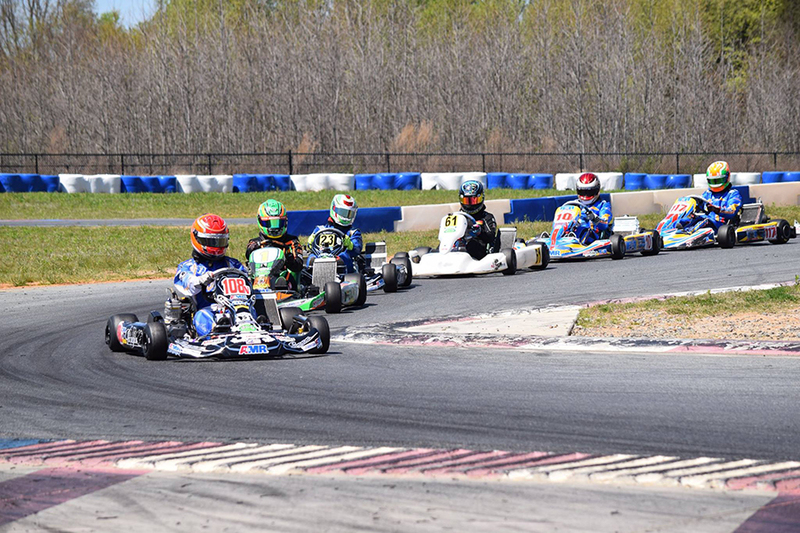 On April 7-9, the United States Pro Kart Series – presented by FIKSE Wheels and MG Tires – opened up its fifth season with the opening rounds of the championship series at the GoPro Motorplex. 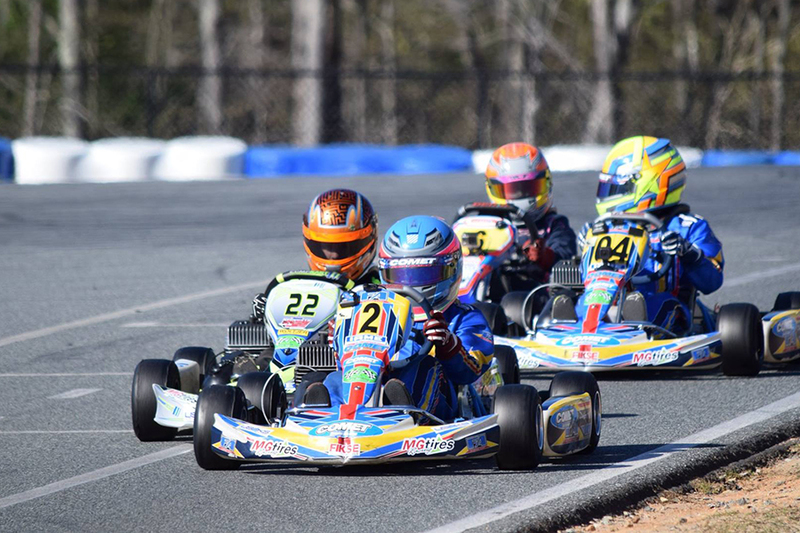 The Mooresville, North Carolina facility hosted the series opener for the fourth time, welcoming 113 entries per day in the seven IAME and Yamaha categories contesting the 2017 season. Wet weather stayed away throughout the weekend, providing dry and sunny conditions for the opening two rounds of the championship chase. Prior to the start of the main events on Saturday, Series Officials gathered on the front stretch, along with representatives from IAME Italy, IAME USA East, IAME USA West, and MG Tires, where everyone observed a moment of silence for karting legends Kyle and Tony Adkins, who recently passed away. The Adkins Family was certainly on the minds of those in the paddock this weekend, and many karts were sporting memorial decals provided by Brian McHattie. The story heading into the weekend was the debut of the new KA100 category. 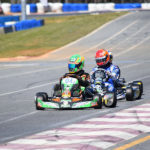 Twenty-seven drivers took part in the inaugural class, including a mixture of Pro, old Yamaha competitors and returning drivers to the USPKS series. Former Yamaha Pro champion Brandon Jarsocrak (KSNA / Praga) was the driver to beat on day one, setting a blistering fast time in qualifying (50.302) to clear the field by over three tenths. He led the entire 15-lap opening heat before fending off Senior rookie Alex Bertagnoli (Franklin / Merlin) for the race win in Heat #2. They were joined by local driver and former NASCAR driver Dusty Davis (VSR / FA Kart). Bertagnoli took the lead with three laps to go, holding on for the inaugural victory. Davis crossed second but was handed a 10-second penalty for the pushback bumper. That put Jarsocrak second on the podium with Josh Hotz (Franklin / Merlin), former series winner Ashley Rogero (CompKart) and popular karting announcer Xander Clements (DCT / Tony Kart) making up the top-five. Sunday began with Fullerton-USA pilot Mike McAndrews posting the fast time in qualifying as the only driver into the 50-second bracket (50.995). Davis was on a mission for redemption, and fought his way up to the top spot to secure the Prefinal win over Jarsocrak and Clements after McAndrews fell down the order. David led the majority of a great battle for the lead, including Jarsocrak and Nick Landi (FA Kart). Davis secured the top spot late, crossing the line first for the victory. Bertagnoli slipped in late to steal the second spot from Landi with McAndrews following him through for fourth, pushing Jarsocrak to fifth. Bertagnoli recorded two wins on Saturday, earning the IAME Pro victory in his first start. 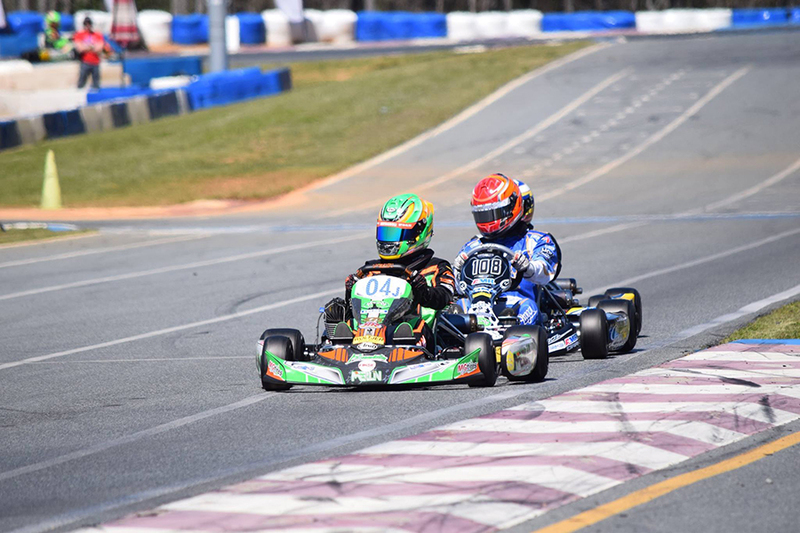 The two-time Junior champion in 2016 was second in qualifying to fellow Senior rookie Lance Fenderson (KSNA / Praga), who posted a 47.590-lap to secure fast time by a just 89 thousandths over the Merlin driver and KartSport North America teammate Brandon Jarsocrak. The veteran Jarsocrak bested the young pupils in the heat races, winning by a half second in Heat #1 before leading all 15 laps in Heat #2 ahead of former series winner Jacob Donald (KSNA / FA Kart). Jarsocrak and Donald ran 1-2 for much of the race until an issue put Donald on the sideline, allowing a charging Bertagnoli to challenge for the top spot. On the final lap, Bertagnoli secured the top spot for the victory. Blake Hunt (KSNA / FA Kart) also slipped past Jarsocrak on the final to steal second. Fenderson and Ashley Rogero (FA Kart) completed the top-five. Fenderson began Sunday as he did Saturday, clearing the field by over three tenths in qualifying with a 47.404. Jarsocrak got the jump from outside row one, leading the Prefinal until Rogero worked past and drove off to the provisional win. A pushback bumper 10-second penalty gave the win to Jarsocrak and dropped her to 10th in the order. Bertagnoli became the lead challenger, and led the majority of the Final. Jarsocrak took the lead with two laps to go, and held on for his first series victory since the GoPro event in April 2015. Bertagnoli settled for second with Fenderson in third. Donald and Hunt completed the top-five. 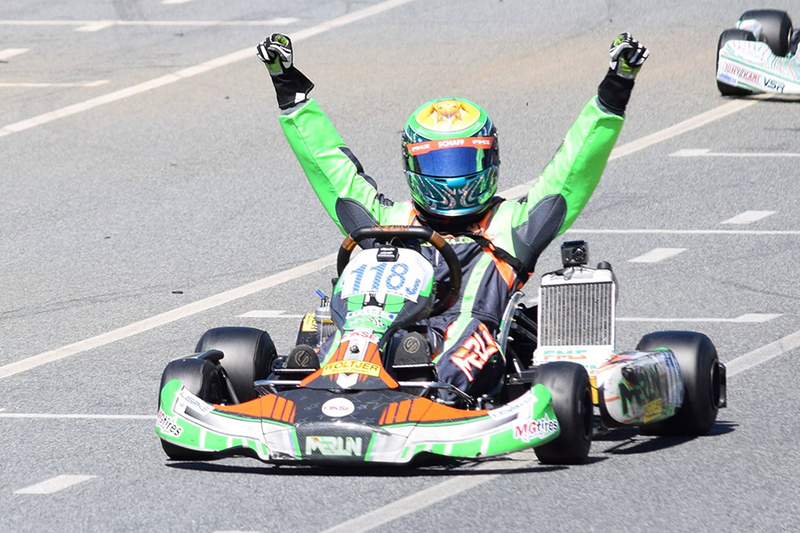 Austin Schaff scored his first USPKS IAME Junior victories in Mooresville to double up in the win column. Saturday’s performance was a sweep of the action, leading from qualifying through the two heat races and leading all 20 laps of the Final. Franklin / Merlin went 1-2 with Maks Kowalski earning his best USPKS result in second. Gray Leadbetter (VSR / Tony Kart) drove to third over fellow female driver Brooke Nachtmann (VSR / Tony Kart) with Hayden Jones (Top Kart) making up the top-five. Schaff found himself looking up the grid after qualifying sixth with Junior rookie Isabella Robusto (CompKart) securing the fast lap in the timed session. Schaff worked up to second in the Prefinal, getting edged out at the line Kowalski for the win. Schaff got the jump at the start of the Final, leading all 20 laps for the second victory with Kowalski winning the battle for second over Leadbetter. Collin Neal (MDD / Tony Kart) ran fourth with Robusto placing fifth. The Yamaha Junior wins were split by James Lynch (Tony Kart) and Collin Neal (Tony Kart). Neal set the pace early on Saturday with fast time in qualifying along with the opening heat race win before Emory Lyda jumped up to P1 in Heat #2. The two swapped the lead a number of times with Lynch waiting in the wings. On the final lap, Lynch slipped past both to reach the checkered flag for his first series victory. Neal ended up second with Lyda third. Arie Venberg (Merlin) ran fourth with Ben Lyda (Merlin) classified fifth. The top three battled again on Sunday with Lyda striking first with fast time in qualifying. Lynch won the Prefinal, only to see Lyda and Neal all cross the line within 47 thousandths of a second. Lynch led the majority of the Final with Neal working past late in the race and secure the victory. Lyda finished third with Ben Lyda and Arie Venberg completing the top-five. The only other double winner on the weekend came in the IAME Mini Swift division by Santiago Trisini. The Florida driver was able to work past top qualifier and Heat #1 winner Brent Crews (Nitro Kart) for the second heat win. After a large lead group early on in the Final, the two worked away from the field with Trisini leading. Crews came just 79 thousandths short at the line with Trisini taking the victory. 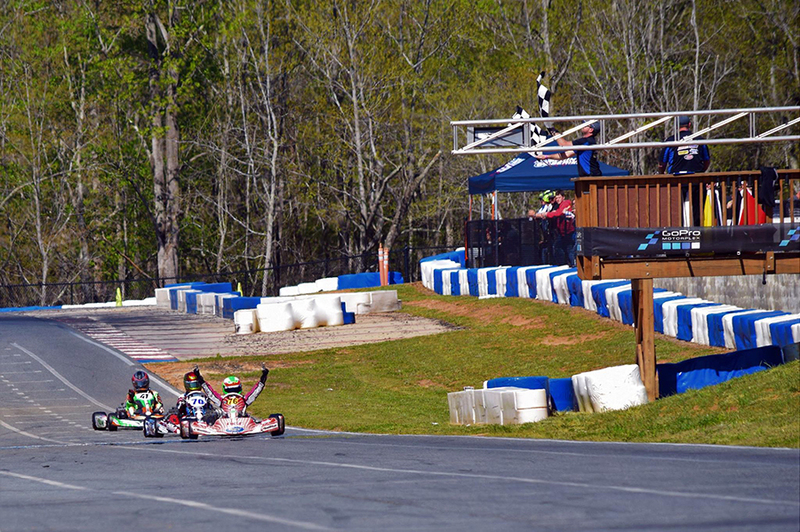 Logan Adams (FA Kart) drove to third ahead of William Robusto (CompKart) and Annie Rhule (PCR). The same two battle for the top spot on Sunday, with Crews holding the advantage after qualifying and the Prefinal. The two went back and forth throughout the 20-lap Final, with at least six lead changes just at the line. When the checkered wave, Trisini was first with Crews second. Robusto improved to third with Adams in fourth while Jacob Graham (Nitro Kart) in fifth. The Yamaha Cadet division saw two different winners – William Robusto and Logan Adams. Robusto (CompKart), a winner in 2016, nearly swept the action on Saturday. Mateo Rubio-Luengo (Kosmic) broke up the perfect score, stealing the Heat #2 win. They were joined by Logan and Garrett Adams in the Final fighting for the top spot. Robusto led the majority of the laps, leading the final six to claim the victory. Rubio-Luengo finished second ahead of Logan (FA Kart), Garrett (FA Kart) and Christian Miles (Praga). Sebastian Ng (Nitro Kart) put his hat in the name beginning Sunday, posting fast time in qualifying. Robusto took over the top spot in the Prefinal, setting up for a great battle in the Final. Logan Adams started ninth, and quickly worked his way to the front, joining Rubio-Luengo and Robusto in the fight for the win. On the final lap, Adams secured the top spot, reaching the checkered flag for his first series victory. Mateo was just back by 66 thousandths of a second with Robusto in third. Garrett Adams and Miles completed the top-five. Northeast drivers Frankie Iadevaia and Ben Maier earned victories in the IAME Micro Swift category. 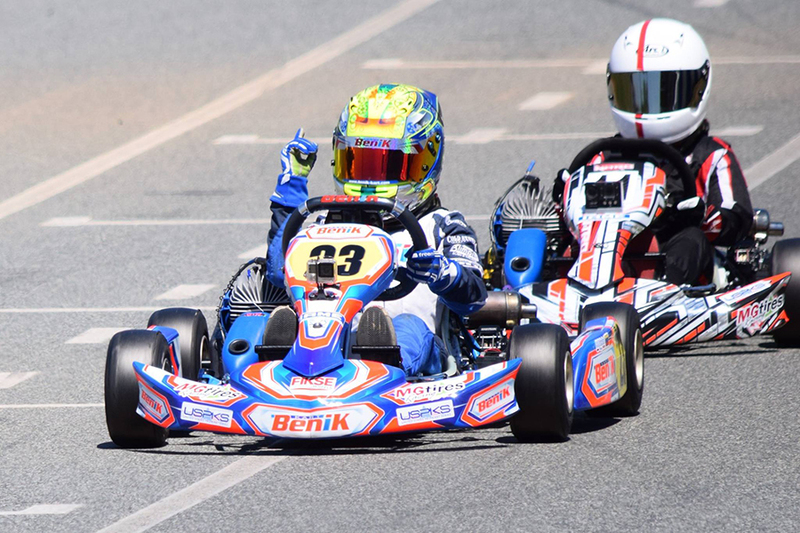 Iadevaia was able to clinch his first series victory on Saturday, beating out Adam Brickley (Nitro Kart) and top qualifier Mateo Rubio-Luengo (Kosmic). Heat #2 winner Ben Maier (Nitro Kart) was fourth ahead of Sam Corry (Benik). Maier scored his first series victory on Sunday, besting the 13-driver field. Rubio-Luengo drove to second with Saturday winner Iadevaia in third. Corry and Ng placed fourth and fifth. This weekend also marked the United States debut utilizing the pushback bumper system. There were a number of penalties issued throughout the weekend as racers learned how far they could push the limits of the system, but the goal of reducing incidents was met. There were zero issues on the starts in the notoriously tricky turn 1 section, and very few overall, yet the racing was still very competitive. The system, while not perfect, still needs some tweaking, and officials have already announced adjustments to the penalties for the next event. USPKS has confirmed the pushback bumper system is here to stay. 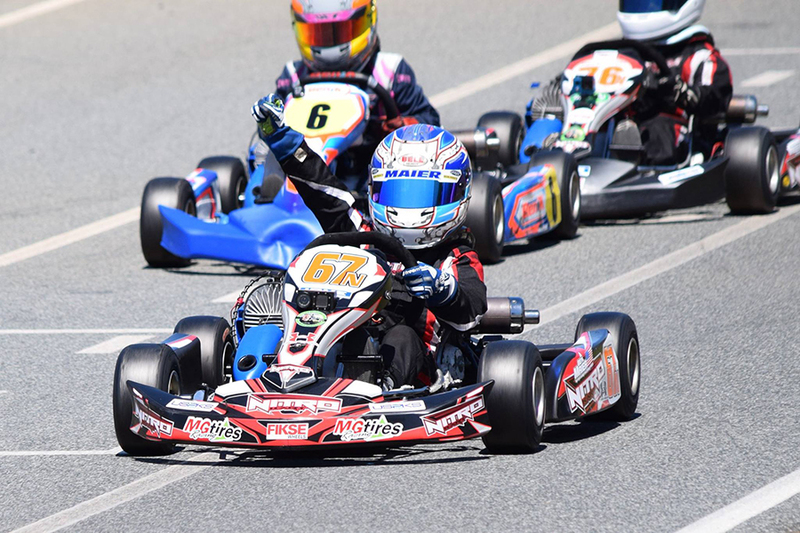 The United States Pro Kart Series continues on June 2-4 at the Pittsburgh International Race Complex in Wampum, Pennsylvania for the Liberty Grand Prix. EKN will be on hand for complete Live coverage and daily reports throughout the weekend. Article by David Cole – ekartingnews.com.